You must call 72 hours ahead of your scheduled tour for a full refund. There are no refunds for cancellations within 72 hours of your tour, or if you decide not to show up. Depending on the payment method you used when making the transaction, your refund will be returned to same gateway within 24 hours of the approval of the refund. Please contact us for any refund requests via our contact page at anytime, or call: (90) 541 543 1880 between 10.00 am – 19.00 pm Turkey time. Yes. 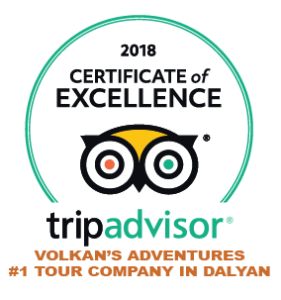 Reservations are required for guaranteed spots on all tours especially considering we are doing only small group tours with limited availability. We understand that you may not have a printer handy when you’re traveling so it is not necessary to have a printed copy. After all we are on a tour with a small group and we have everyones information for pick up arrangements. Is it secure to make transactions on your website? The infrastructure of volkansadventures.com that has been improved by the principle of “3d Secure” and “privacy of personal information” is operated by the advanced communication protocols including SSL technology. By this means, your credit card information that you have used in your shopping in volkansadventures.com is automatically encoded by coding system with 128 bits in your computer and sent to the bank in this way. Namely, since your credit card number and password information are only displayed between your computer and bank, while they cannot be monitored, at the same time, they are also stored by our systems. E-commerce websites to use this system around the World are required to certify the SSL certificate obtained, by making a deal with the internet security company that we preferred to do business, such as GlobalSign, and providing all certificates and standards that this company requested. As volkansadventures.com, we have started to take all these measures for your security. You are shopping within the standards of the internet security firm commonly used in all over the world in all your shopping you will perform on volkansadventures.com. In order to protect yourself from the insecure websites that the personal information has been abusedly carried, you should be certainly sure that the page addresses that you have entered your credit card information are changed from http to https, the icons consisting of lock in lower left-hand corner of the Internet Explorer; and lock or key in bottom-right of Firefox and blue line are displayed. That would depend on the tour but wear whatever is comfortable. It is recommended to have a hat, sunglasses and plenty of sun cream with you on hot summer day trips. Other than what has been listed on each tour’s detail pages, not much. Remember, all our trips cover meals and complimentaries. We go on our tours in the rain, snow, wind and any other weather conditions that nature decides to throw at us. After all, we’re going on adventures! If the weather is unsafe for any reason, the trip will be changed or postponed. You will be notified if there are changes due to extreme weather conditions but that is very unlikely. Whats Your Company's Legal Title, Address, Registration, VAT number?